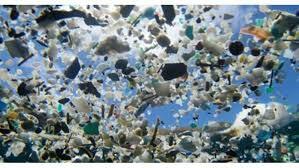 I’ve read that there is an island of garbage floating in the Pacific that is twice the size of France. True? Not sure. That’s a lot of garbage. A. Lot. Of. Garbage. And how do we do? The only industrialized western country on the list of top 20 plastic polluters is the United States at No. 20. Which certainly means that we are not top 20 per capita. This entry was posted in Environment and tagged Ocean Plastic. Bookmark the permalink.